Take a left turn out of Juan Santamaría International Airport and just keep going around to the left as you build to the legendary kilometer long point at Pavones. Amazing waves along the Central Pacific coast at Playas Jacó, Hermosa, Esterillos, and Dominical are interspersed with waterfalls, jungle hikes and great side trips if you can stand to be distracted from the breaks that long. San José is the capital of Costa Rica and home to the National Theater, Planetarium, a number of beautiful parks, as well as world class hotels, casinos and restaurants. The mercado central, and museums of Jade and Gold are all worth a visit. Popular day trips to local coffee farms, whitewater rafting rivers, and canopy tours through the rainforest treetops can be arranged through most hotel tour desks. Several National Parks and Reserves are within easy reach of the capital including Poás and Irazú volcanoes, the Lankester Botanical Gardens, and Braulio Carrillo rainforest. Because of it’s central location San José is a transportation hub and most roads and domestic flights pass through. Juan Santamaría is Costa Rica’s main international airport located approximately 18 km west from the city center. 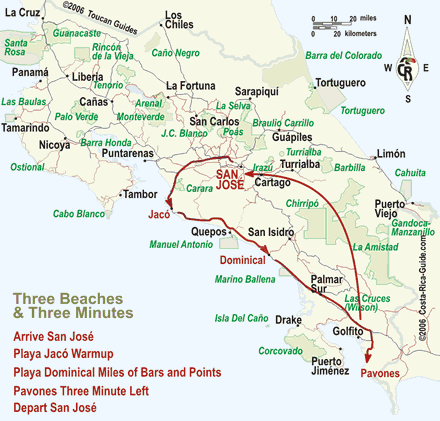 Playa Jacó has some of the biggest most consistent waves in Costa Rica. A party atmosphere and a few quiet hideaways all a little over an hour from San José make it the most popular spot for a quick trip to the beach. Just south of Jaco (ten minutes by taxi) is the Playa Hermosa Wildlife refuge which features waves at least as big and several miles of undeveloped beach teaming with water birds. Playa Dominical is not only home to some great surf but there are dozens of waterfalls in the mountains behind the beach. The town is small and you can walk around sampling the different bars and restaurants until you wander down to somewhere on the beachfront for a beer as the sun sets into the Pacific. Pavones takes some getting to but it’s worth it. One of the wildest regions of Costa Rica there are tons of little places to explore when you’re not waiting on the mile long left that comes up the mouth of the Golfo Dulce from the open Pacific. Your interest in this itinerary will be automatically included in your request if you use the quick contact form on this page for more information.